People ask AICR about many things - claims about diet and cancer they've read, the latest weight-loss book on the market, etc. In the past few years, we've heard from a lot of people asking about The China Study, and the documentary film Forks Over Knives. If you've read the book or seen the movie, you may wonder how their recommended diet compares to AICR's Recommendations for Cancer Prevention. AICR's Recommendations for Cancer Prevention outline a plant-based diet that can include fish, poultry, limited amounts of red meat and moderate amounts of dairy. The overall recommendation from The China Study and Forks Over Knives, however, is that the best diet is a completely vegan diet – no animal products. AICR’s Recommendations for Cancer Prevention are based on our expert report and the Continuous Update Project – independent, systematic reviews of the global scientific literature supplemented by the analysis and judgments of an expert panel. Eat mostly foods of plant origin, like vegetables, fruits, whole grains and legumes. Limit how much red meat you eat and avoid processed meat. (Eat less than 18 ounces (cooked) of beef, pork or lamb per week; avoid smoked, cured or salted meats). Limit alcoholic drinks. If you drink, limit to no more than two drinks a day for men and one drink a day for women. These five Recommendations add up to a diet than can contain some, little or no animal products. AICR’s review of the evidence does not show an additional benefit from following a completely vegan diet. In our review, poultry and fish are not linked to increased risk for any specific cancers. AICR does not make any specific recommendations about dairy products. Our Expert Report and Continuous Update Project indicate that there is strong evidence that milk and calcium are linked to a decreased risk of colorectal cancer. However, our reviews also indicate that there is ‘limited but suggestive’ evidence that dairy products and diets high in calcium increase the risk of prostate cancer. This is an active area of investigation as researchers design studies to better understand these findings, so stay tuned. An easy way to picture AICR’s dietary advice: at every meal, fill at least 2/3 of your plate with plant foods and 1/3 or less with animal foods. 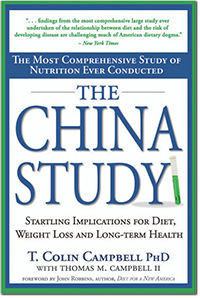 Dr. T. Colin Campbell’s The China Study is based on his interpretation of research he conducted in the 1970s in China. The Forks Over Knives filmmakers rely heavily on Dr. Campbell’s research and singles out animal products as the real culprits in cancer and other chronic disease. Forks Over Knives points to compelling case studies of people improving their health by turning away from the traditional meat-center, high-sugar American diet and adopting a healthier, lower-calorie vegan diet. Their claim is that animal foods play a major role in causing chronic diseases. This kind of radical diet change, done carefully and well, will certainly improve overall health. Keep in mind that these diet changes not only eliminated meat and dairy but also eliminated fast food, highly processed foods and sugar-laden drinks. In many cases these changes led to a healthier weight. And a healthy weight = lower cancer risk. However, AICR’s ongoing review of the evidence does not support eliminating animal foods as a necessary step for health improvement. And we know that diet is only a piece of the puzzle. As noted above, our reports show that the link between carrying excess body fat and cancer is just as convincing. Health experts agree that putting mostly plant foods on your plate is the healthiest diet. How or whether you include fish, poultry, meat or dairy is a personal preference. AICR has shown that limiting red meat to less than 18 ounces (cooked) per week and avoiding processed meat helps lower risk for colorectal cancer. Apart from not smoking, being at a healthy weight is the most important thing you can do to protect against many cancers. Physical activity helps protect against cancer directly (by regulating hormones that could otherwise encourage cancer growth) and indirectly (by helping you keep off excess fat). Aim for 30 minutes of moderate physical activity every day. As fitness improves, increase either the intensity or the length of your favorite activity. Why are we at AICR so concerned with getting out the urgent message about lifestyle’s role in cancer risk? Because the evidence shows it could save millions of lives. If all Americans followed this advice, the number of cancers that now occur in the US would be cut by 1/3. Imagine that: That’s about 345,000 families per year that would be spared seeing a loved one touched by cancer. (Add not smoking to the mix, and that number climbs even higher.) This is why AICR arms individuals with the information and tools they need to take these proven steps. Find practical information for making healthy changes that will help protect you, and your family, from cancer. And learn how you can help fund the AICR research that is transforming our understanding of how to prevent, treat and survive this terrible disease.